On June 25, the University of Santa Monica’s generous supporters joined Co-Directors Drs. Ron and Mary Hulnick, USM Chancellor John Morton, and his wife, Leigh Taylor-Young, for a spectacular celebration of USM’s pioneering past—delivering more than 35 years of Soul-Centered education—as well as its radiant present and luminous future. I am here because of my Gratitude for all that I have received at USM. Indeed, Gratitude was the theme of the evening as the USM community basked in the True Magic of the Heart, which is the hallmark of a USM education. Throughout the evening, Ron and Mary extended their profound appreciation for the financial support that makes it possible to share USM’s transformational education with so many. Following a lively gourmet dinner in a ballroom sparkling with candlelight and fresh flowers, guests were escorted into the theater where USM President Ron Hulnick impressed us with his very own magic skills. Ron went on to introduce world-renowned comedic magician Dana Daniels. 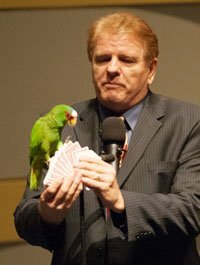 Hilarity ensued when Dana and his psychic parrot, Luigi, took the stage to perform a combination of brilliantly timed stand-up comedy, spellbinding magic tricks, and spectacular audience participation. An unplanned theme emerged as audience members described themselves as doing “Transformational Work,” which had the guests in stitches and thinking, “only at a USM event!” Dana and Luigi’s grand finale was the disappearing bird act—with Luigi “disappearing” only to be revealed moments later on Dana’s back! When the laughter subsided, the lovely hosts, Barry Clark and Eliza Swords, invited the guests back into the main hall for gifts, an array of luxury chocolates, and coffee and tea. The room was bustling late into the night as old friends were reacquainted and new connections were forged. 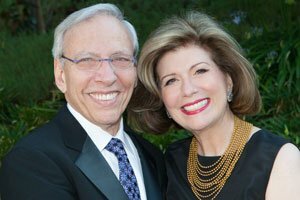 Ron and Mary also share their gratitude for the generous and talented donors who contributed to another successful Silent Auction. 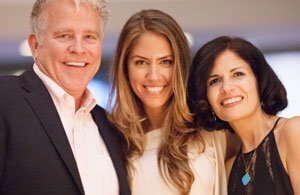 Guests were buzzing with enthusiasm as they bid on everything from beautiful works of art and jewelry to once-in-a-lifetime experiences, such as dinner with Ron and Mary at The Magic Castle. Donors of these fine goods included Sat-Hari Khalsa and Nathaniel Sharratt (Amrit Jewelry), Miranda Alcott, Katie Beckley (Awaken the Peace Jewelry), Jorgea Black, Donna & Paul Bond, Helen Bradley, Robert DeLaurentis, Matt Hanover, Rachel Katz (Rachel Katz Jewelry), Lily Lambert, Maria Machado, Paula Majeski, Hugo and Debra Saavedra (Saavy Naturals), Andy Scarborough, Ashley Sloan, Jessica Vignolle, The Ambrose Hotel, The Hyatt Regency Hotel, and more! One of the primary ongoing intentions at USM is to foster and nurture this Culture of Giving. Such a culture begins with the understanding that giving and receiving are part of the circular flow of loving, caring, and sharing that are integral to the University’s Soul-Centered educational process and supportive of the University’s well-being. Ron, Mary, the Board of Trustees, Chancellor, Faculty, and Staff share their deep gratitude for your generous financial contributions that continue to sustain and expand the University into its luminous future. Step into the magic of USM’s Evening of Magic by viewing these photos!